They will be taken on over the next five years. ESB IS SET to recruit 300 apprentices over the next 5 years. In a statement released today, ESB said its apprenticeship programme is essential to ensure the company has “the requisite skills available for us to maintain, develop and enhance our electricity system so that it meets the needs of modern Ireland”. 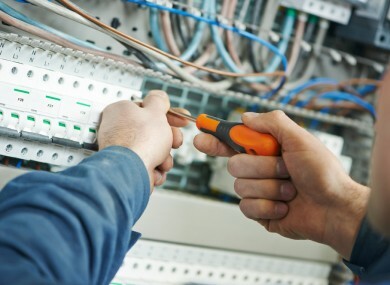 The announcement was made at the ESB Networks Training Centre in Portlaoise where network technician apprentices complete 23 weeks of training during their four-year electrical apprenticeship. This is in addition to 42 weeks spent in Solas and IT colleges, and “significant on-the-job training segments”. ESB Chief Executive Pat O’Doherty said the programme is “a critical part of the ongoing development and transformation of ESB”. We are Ireland’s leading energy company and our staff are among the best in the world and are recognised globally for their skills in the energy sector. We want to continue to renew and develop this workforce, for our company and our economy. The programme is open to candidates who have successfully completed their Junior Certificate exams. Pat O’Doherty, Chairman of the Apprenticeship Council, said his organisation is “working to ensure that the development of skills in Ireland is focused on areas where there will be greatest need”. Email “Looking for work? ESB is hiring 300 apprentices ”. Feedback on “Looking for work? ESB is hiring 300 apprentices ”.